Stari Most is without a doubt the most famous and photographed bridge in all of Bosnia and Herzegovina. It’s probably the number one thing most people want to see when they visit Mostar. Although it was rebuilt 2004, Stari Most still looks like it did when it was first built in the 16th century. 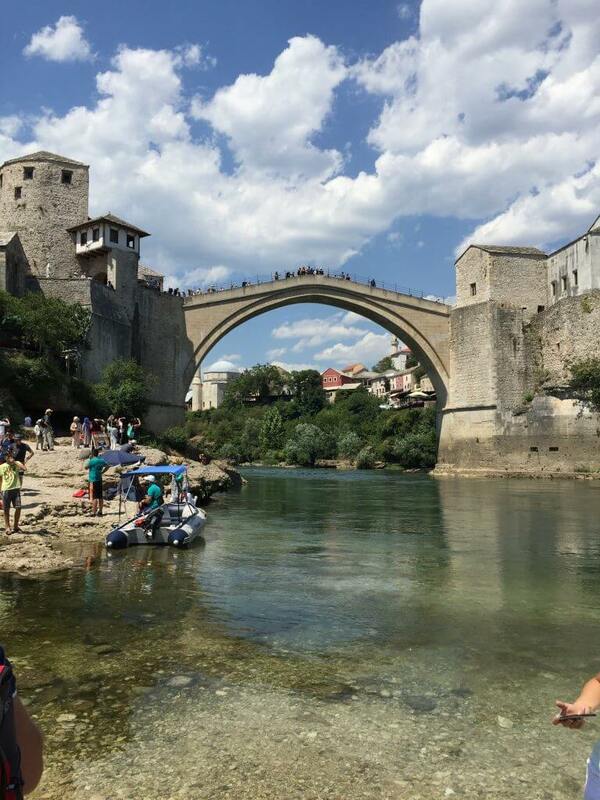 Since we know you want to get that perfect picture for Instagram, Facebook, or simply your photo album at home, here are the best places to photograph Stari Most. The Urban Grill Restaurant is right on the main pedestrian road (Mala Tepa) in Mostar. Most of the shops, restaurants, and people are on this road too. If you don’t know where you’re walking, you’ll inevitably end up here as it takes you right through Mostar and across Stari Most. 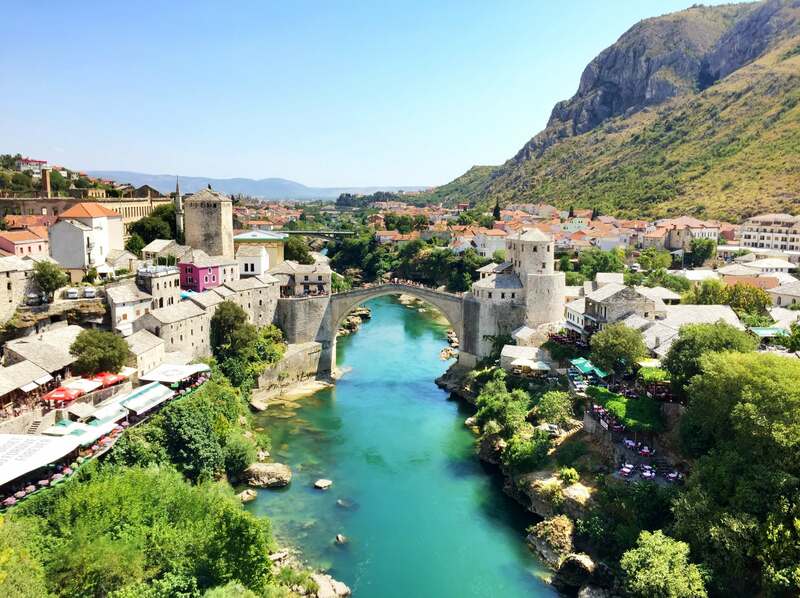 Urban Grill’s view of Stari Most is beautiful. Although Urban Grill is not free because it is a restaurant, the food was really good and pretty cheap, as is food throughout Mostar. 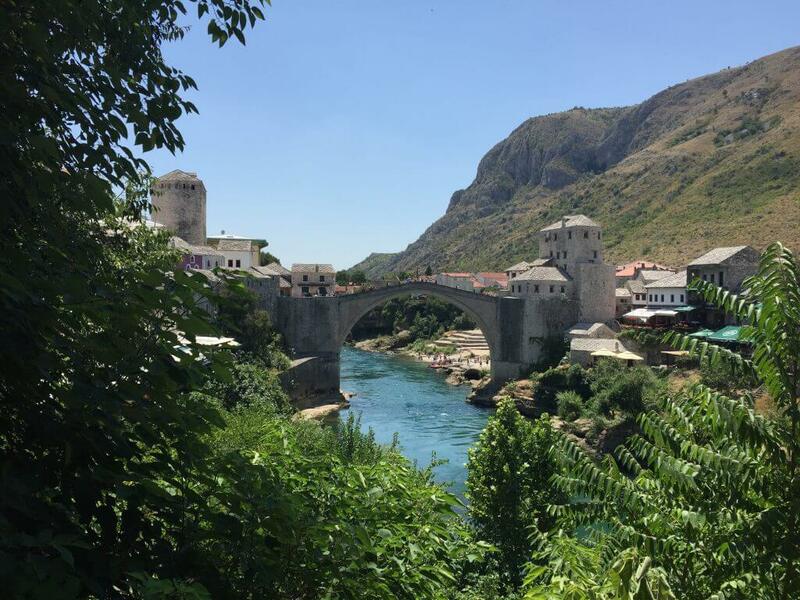 It was a nice place to sit down and enjoy a delicious meal while being in the shade (it was over 100°F in the summer when we were there) and get an awesome view of Stari Most. We also saw someone jump off the bridge from Urban Grill which was pretty cool, even though it lasted all of about 3 seconds. Let us preface this with the fact that we believe the Koski Mehmed Pasha Mosque is the single best place to photograph Stari Most from. Similar to the previous one, it isn’t free. You have to go to the mosque (about 300 feet north of Stari Most on the east side of the Neretva River) and pay to get in. Plus, it costs a little extra if you want to go up the minaret. The admission cost was about 10 KM ($5-6) to climb the minaret and was cash only. The mosque is pretty small, and most people pay to climb the minaret for its views instead of tour the actual mosque. We recommend that you wear modest clothing. They didn’t make Becca cover up her hair as other mosques are known to do, but since she was wearing shorts, they gave her a shawl to wrap around her legs so they would be covered. If you’re not one for tight spaces, the minaret probably isn’t for you. 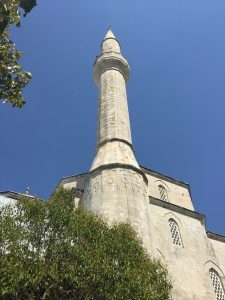 The Koski Mehmed Pasha Mosque minaret is pretty tall and very narrow. The staircase is a tight spiral and only one person can go at a time, up or down. It’s a pretty tight squeeze, so if you’re at all claustrophobic, it might be a struggle. Once you get to the top, the views are outstanding and without a doubt some of the best of all of Mostar, as well as the best place (in our opinion) to photograph Stari Most in Mostar. Under Stari Most offers great views of the bridge too. The views are a little different because they’re from below and can be really cool if you’re under Stari Most when a diver jumps from it. To get down to the beach and river under Stari Most, go to the west side of the bridge, walk a little until the road opens up, and take a left just before the restaurant Sadrvan. Once you take the left, go around those shops and restaurants and take the steps down to the beach area. The walk down is short and not too steep. 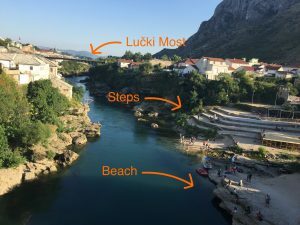 There are two great places to photograph Stari Most from under it with the first being on the “beach.” It’s in quotations because it’s not a typical sandy, layout-and-relax beach, but rather a place where you can go into the river if you so choose. The beach is right at the base of the bridge, and you can really get a sense for how tall it is. Again, this would be a great place to watch divers jump from the bridge. Plus, you could ask them how their jump was when they get out of the freezing water of the Neretva River. This would be especially interesting to see how the tourist divers feel post-dive because the Bosnian divers do it all the time. From the beach, you can walk away from the bridge a bit to an area where there are some steps built into the rocks along the river bank. It’ll probably be less crowded than the beach area, seen in the photo above. 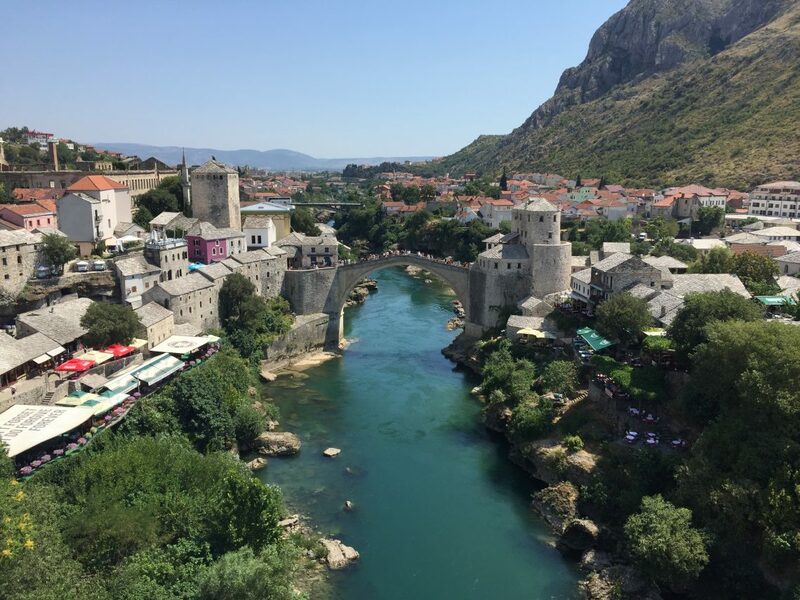 Photos of Stari Most from the steps offer a different perspective from those taken from the beach area. It’s worth taking the short walk to get to the steps because your photograph of Stari Most will look different from ones taken from the beach. You’ll be able to capture more of the surroundings of the bridge. However, there’s probably a good chance you’ll get a lot of people in your photo, especially if you’re there during peak season and in the middle of the day. 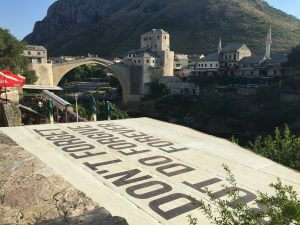 Walking on Stari Most itself or right off of it gives you great views of not only the bridge, but of Mostar too! The spot pictured above would be a great place to photograph people jumping off Stari Most. People jump off every day, so there’s a pretty good chance you could see someone doing it. 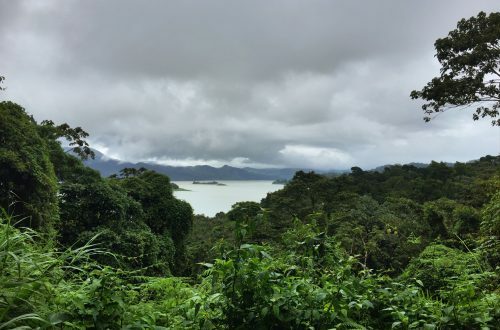 You could even jump off yourself if you’re crazy daring enough to try it! 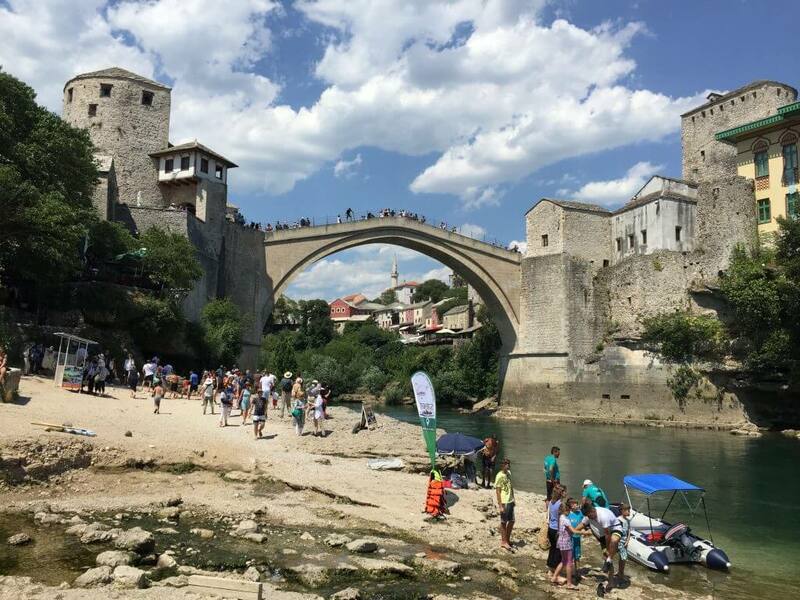 Something to be aware of is that walking on Stari Most is fairly slippery as the stone bridge has been smoothed out by the thousands of people who walk on it every day. Be careful when going up and down it because it’s easy to slip a little. Stari Most has a little bit of an incline from the sides to the top of the bridge. 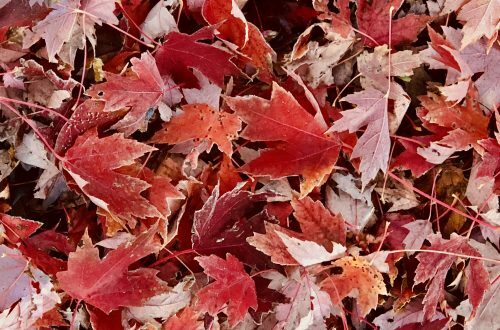 It’s not a dangerous walk by any means, but it’s something to be aware of if you have difficulties keeping your balance. Lučki Most is another bridge in Mostar that’s further south than Stari Most. You’ll get great photos of Stari Most, the Neretva River, and the Mostar skyline with it’s numerous minarets from here. 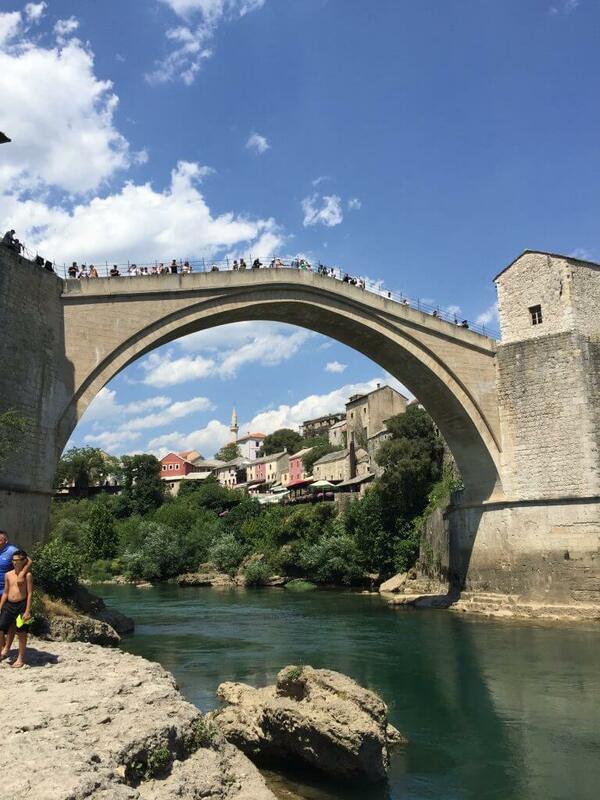 During the day, you might even get to see people jumping off Stari Most and divers practicing on smaller platforms in the foreground to the right of Stari Most. Divers practice here before their big dive off Stari Most itself. If you’re interested in diving ask some of the divers at the top of the bridge, and they’ll take you to the river to practice. You’ll jump in from two shorter platforms before making the big jump off the top of Stari Most. The last place on our list to photograph Stari Most is from Old Town Mostar. There are numerous vantage points from which you can take a photograph of Stari Most. Our favorite is the one above because it highlights the history of the region and the importance of forgiveness. After all, it really wasn’t too long ago at all that there was a war going on here. Take the time to stop and appreciate the beauty of Stari Most and all of Mostar while walking through the Old Town area. All in all, there’s not a bad place to photograph Stari Most. 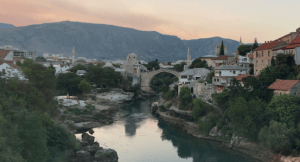 Mostar is a small city, so it’s possible to get to all of these places within a day. The bridge is an incredible work of architecture that’s in a beautiful setting with lots of contrasting colors. Let us know if you know of other places to get a great photograph of Stari Most in Mostar!